Jealousy and ambition threaten the life and legacy of King Mufasa's son in Disney's 1994 animated family movie The Lion King. Will Simba overcome the evil that endangers him and the fear that prevents him from assuming his rightful place as his father's heir? The Lion King, Mufasa, and his wife Serabi have had a son, and all of the animal kingdom has come to Pride Rock to pay homage to the recognized heir to the throne. Everyone in the kingdom celebrate the young prince's arrival, except Mufasa's brother, Scar, who is not pleased that "the little furball" has been born, because the cub's birth means Scar is no longer in line for the throne. The little prince grows and becomes a romping, vivacious youngster. His best friend is the lioness whom he is supposed to marry, although both he and Nala find that idea rather off-putting. One day, their play takes them to the only place they are forbidden to go -- the Elephant's Graveyard. In that place, the jackals roam free, and the jackals have no loyalty to King Mufasa. Unbeknownst to the King, his brother has formed an alliance with the jackals and has told them that if they ever see the young prince, they are to kill him. Just before the jackals kill the two cubs, Mufasa arrives, having been alerted by Zazu, his vizier, that the children were headed to the forbidden place. Simba's father is furious with him for his deliberate disobedience, and in the ensuing talk, he tells Simba that the ancient kings are enthroned in the stars, watching over all of the kings that follow them. Frustrated by the jackals' failure to kill Simba, Scar prepares another plot to do away with the young prince. He lures Simba into a ravine and starts a stampede of wildebeest. Simba is in imminent danger, but the ever-alert Zazu has once again warned Mufasa of the danger to his son. This time, however, Mufasa is killed while saving his son. Ever able to take advantage of a situation, Scar convinces the grief-stricken Simba that his father's death is his fault and, as a murderer, he should have the decency to leave Pride Rock forever. Simba believes Scar and runs away. In the absence of both king and heir, Scar assumes kingship of Pride Rock. Simba is found, dying in the desert, by Pumbaa and Timon, a warthog and a meerkat. They bring him back to health, and Simba reaches maturity while living with them. They teach him that the best way to live life is by the philosophy "No worries," which is a thoroughly irresponsible view of life. But Simba is relatively happy. One day, Nala is out searching for food, because Scar's management of the pridelands has ravaged the land and left no food for the lions. In her search, Nala comes to the place where Simba is living with Pumbaa and Timon, and she is shocked to find Simba is still alive. She argues with him, trying to convince him that he has a responsibility to take his father's place as the Lion King, but Simba doesn't see it as his problem. Nala is disgusted with his attitude. Late that night, however, Rafiki arrives. This mandrill is the record-keeper and soothsayer, and he had believed Simba dead until the signs told him otherwise. Now he has sought out the young king to convince him to retake the pridelands and save the lions from the dreadful rule of his uncle. It is Rafiki who recalls to Simba the words of his father, and who shows Simba that his father lives on in him. 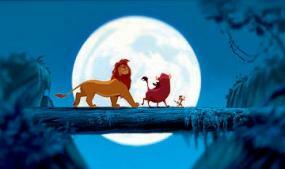 Simba's courage is fired, and he takes off for the pridelands, with Nala, Pumbaa, and Timon in pursuit. At Pride Rock, Simba is appalled by the state in which he finds the once-lush kingdom his father ruled. He confronts his uncle and the jackals, and the lionesses join him. Scar tries to turn the other lions against him by revealing to them that it is Simba's fault that Mufasa is dead, but his plan backfires. Eventually, Scar is forced to admit that he, in fact, could have saved Mufasa, but instead pushed him to his death. Simba attacks Scar and defeats him. 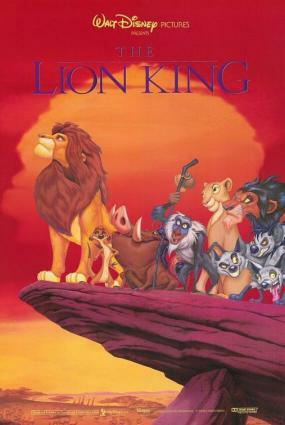 Simba assumes his father's place as King of Pride Rock and banishes the jackals. The land begins to heal, and Simba and Nala are married and produce a son of their own, whom they present to the assembled animals just as Simba was presented so many years before.